Quan Wan is an exoplanet twin of Earth and the life on Quan Wan are shape shifters. The warrior Kings and Queens are striving for control of the planet and its Star. 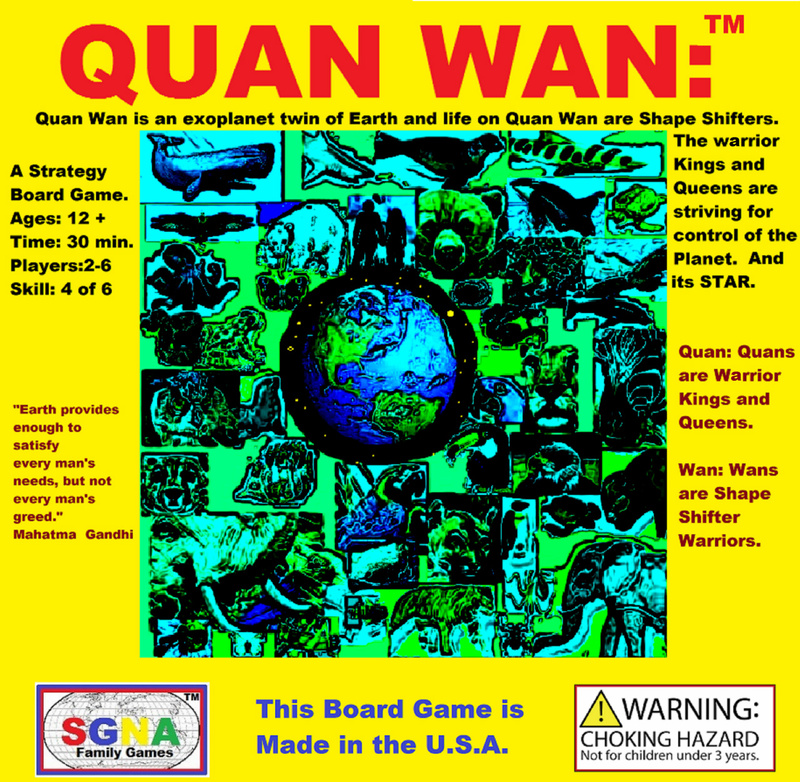 Quan Wan is a strategy board game. Quan Wan is played by 2 to 6 people. Ages to play Quan Wan is 12 to Adult. Playtime for Quan Wan is about 30 minutes. Quan: Quans are the Warrior Kings & Queens. Wan: Wans are Shape-Shifter Warriors. The objective of the game is to be the first player to move the Quan Warrior King/Queen token to the center star only after all the black and white Shape-Shifter (Wan) tokens have been moved out of your pie section. Quan Wan contains 78 flat, round tokens about 1 ¼ inch diameter round. 6 of these tokens are Quan Warrior King/Queen tokens, each labeled with a King or Queen Crown. The Wan tokens are coloured white on one side and black on the other side. These are Shape-Shifter tokens. Quan Wan is played with a single six-sided dice, numbered 1 through 6. Each player picks a pie section to play on. At the start of the game each player is given 12 Shape-Shifter tokens and 1 Warrior King/Queen token. Each players’ King/Queen is placed on the black star in their pie section. Each player places their Shape-Shifter tokens, BLACK side up, on the white stars in their pie section. The dice role determines the number of moves a player can make with his Shape-Shifter tokens. Example: if a player roles a five, then that player may move 5 Shape-Shifter tokens one space each or move 1 token five spaces or 1 token two spaces and 1 token three spaces or any combination of moves that add up to five spaces. Each star in a players’ pie section is a space that the Shape-Shifter tokens can move to or through. The black Shape-Shifter tokens cannot move backwards, they can only move forwards toward the CENTER STAR, within the players pie section. A player cannot move his King/Queen Token [Quan] until all Shape-Shifter tokens [Wans], black or white, are out of their pie section. Shape-Shifters cannot jump, so if a Shape-Shifter token is on a space, another Shape-Shifter token cannot land on it or move through it. 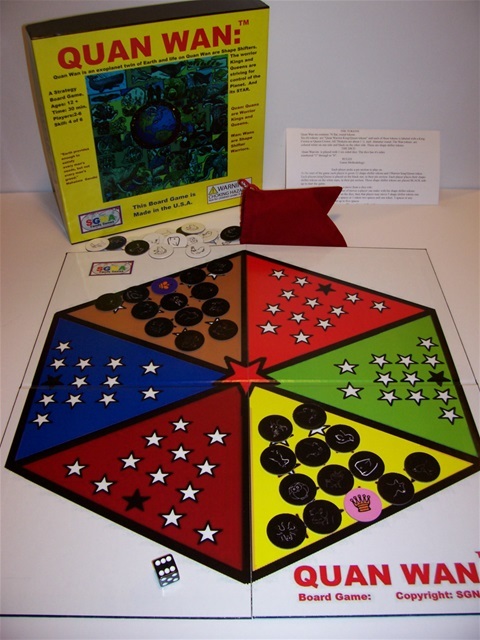 When a player moves a black Shape-Shifter tokens through the center star that player has the choice of removing the black Shape-Shifter token from the game or continuing the move into an opponents pie section. Example: A player roles a 6 and it is only 3 spaces to the center circle; the player can move their Shape-Shifter token two spaces into an opponents pie section or he can remove the Shape-Shifter token from the game. When a black Shape-Shifter token moves past the center star into an opponent’s pie section it must be turned over so the white side is turned up in the opponent’s pie section. The white Shape-Shifter token is now part of your opponent’s Shape-Shifter token group. White Shape-Shifter tokens can move in any direction in a pie section, and are removed from the game once they pass through or land on the center star. If a black Shape-Shifter lands on the center star it has to be removed from the board. First, place the playing board on a table; the players sit around the board. Each player sets up his tokens to start the game. The first player rolls both dice and moves his shape shifter token or shape shifter tokens. Play then moves clockwise. A player cannot move their King/Queen token until all the Shape-Shifter tokens, black or white, are out of their pie section. The first player to land their Warrior King/Queen token on the center star [or pass through it] wins the game.